And today, we celebrate this year’s Law Day Theme, Separation of Powers. What can you do to celebrate with us? Here in Ramsey County, the Law Library and the Ramsey County Bar Association will be hosting a CLE on May 3 featuring Hamline Professor David Schultz, who will be presenting, “The Court, the Constitution and Separation of Powers in American Law and Politics.” Profession Schultz will be addressing why the framers wanted separation of powers along with other concepts, such as checks and balances, to be a feature of American law and politics. The CLE is at noon, and will be held in Room 40 (in the lower level of the Courthouse), and is free to the general public and Ramsey County Bar Association members. CLE credit is available. If you have never been to the Courthouse, one-hour courthouse tours will be available on May 3 at 10 a.m., noon and 2 p.m. Reservations are not required. All tours will meet at the base of the Vision of Peace statue. Tours are courtesy of the Ramsey County Historical Society. The Ramsey County Law Library has a new book on this topic called, The Supreme Court in a Separation of Powers System: The Nation’s Balance Wheel by Richard L. Pacelle, Jr. 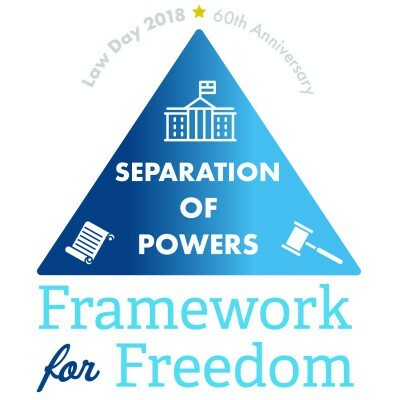 The President’s Proclamation on Law Day is posted on Whitehouse.gov, and you can learn more about Law Day at the ABA website.